At last Egyptian politics is moving. President Mohamed Morsi is slowly building on his summer 'coup', when he stared down Egypt's generals and put his men in the top army and defence positions, following terrorist attacks in Sinai which the army, so old and bumbling, so involved in Egyptian internal politics, failed to prevent. Now, he has stared down Israel's generals, and dealt as an equal with US President Obama to bring US pressure on Israel to back down in its planned invasion of Gaza. Egyptian Prime Minister Hesham Qandil was sent to Gaza 16 November at the height of Israel's current Operation Pillar of Cloud, forcing Israeli President Netanyahu to call a unilateral truce to avoid killing the Egyptian leader. US Secretary of State Hillary Clinton rushed to Cairo to show Washington's support for Morsi, making it clear that Obama was starting a new leaf, finally understanding who his real ally is in the Middle East, and putting Netanyahu in his place. There will be no repeat of Israel’s humiliation of Obama with the 2008 Operation Cast Lead. Then, just hours after Morsi, the world's wise peacemaker, waved good-bye to Hillary, but with his old-guard judiciary poised to dissolve the Constitutional Committee and destroy all hope for carrying the revolution forward, the unassuming president stared them down too, issuing a decree putting his decrees above judicial review. And for the second time, he dismissed the procurator general, Abdel Meguid Mahmud, who has presided over the legal stonewalling of prosecutions of counterrevolutionaries -- this time not backing down. The time for dawdling and letting criminals off the hook is over. The new prosecutor general, reformer Talaat Ibrahim Abdallah, has ordered a new trial of Mubarak and police and thugs let off scot-free by the old judiciary. And watch out, Mubarak-appointed Supreme Constitutional Court, don't you even think about disbanding the Constitutional Committee that is so painstakingly putting together a constitution. (Liberals and Christian secularists resigned from the committee, doing their best to sabotage it, revealing where their sympathies lie.) Or about disbanding the Shura Council on some technicality, as you did the lower house in May, in a conspiracy with the generals to sabotage the revolution. The secularists should look at the writing on the wall. Egypt is a devout Muslim country, where Christians are protected by Islam and cultural liberals are tolerated. These Western-inspired forces will never prevail, so they should work with Islamists, not against them, if they want to maximize social harmony and their own rights. Sadly, the opposition is increasingly siding with the Mubarak crowd. "President Morsi said we must go out of the bottleneck without breaking the bottle," presidential spokesman Yasser Ali said. The opposition would rather see the bottle break that get Egypt's life blood flowing again. Islamic civilization has been endangered for centuries now, battered and undermined by the Western secularist onslaught. Finally, Muslims are doing something about it. Now the Egyptian revolution of 2011 -- which is Islamic, as elections since then prove beyond a doubt -- is in danger, and the Muslim Brotherhood is showing it has spine and smarts. In both assertions of presidential power since then -- in August and November 2012 -- Morsi used a brief window of opportunity to maximum effect. His decisive steps caught observers by surprise, but surprise is the essence of revolution. Waffling and compromise lead to paralysis. Anyone who wants to be part of a new Egypt, to shake off the imperial yoke looking for inspiration in Islam, should be delighted and inspired. Instead, MB offices in Port Said and Ismailia and Suez were fire-bombed, and liberals and judges, reinforced by the Mubarak crowd -- now more and more assertive -- are demonstrating angrily at the high court in Cairo and the judges' union has called a strike. Some talk of impeaching the president as a traitor. The counterrevolutionaries are continuing to expose themselves. "The decisions I took are aimed at achieving political and social stability," Morsi explained, vowing to firmly enforce the law against hooligans hired by loyalists of the former regime to attack security forces, state and party institutions. Under prosecutor Meguid, it was beginning to look like no one would be held to account for the tens of thousands who were tortured and killed during Mubarak's reign, for the billions that were stolen, and the flagrant rigging of elections. The rich, corrupt old guard continue to pay thugs and unemployed to disrupt civic life, to bring discredit to the revolution. They have been doing this from day one and there is no reason to believe they have stopped. Revolutions are never tea parties. The Muslim Brotherhood (MB) have a clear vision and, along with the Salafis, represent the overwhelming majority of Egyptians. The fractious secular liberals and socialists plus the Christians represent only a quarter of Egyptians, and are united only against Mubarak and now against the MB. They include Mohamed ElBaradei, whose long international career, we should remember, was in the service of the imperial world order. He is a nice Arab, a laid-back, secular Muslim, no threat. How else could he have been appointed AIEA chief and crowned Nobel Peace Prize winner? Morsi has “usurped all state powers and appointed himself Egypt’s new pharaoh," ElBaradei pontificated. Other dissidents include the also-rans in the June presidential elections. Morsi’s main rival, Mubarak's last prime minister Ahmed Shafiq, fled Egypt in disgrace after the election, facing arrest on corruption charges, leaving behind Nasserist Hamdeen Sabahi, ex-MBer Aboul Fotouh, and former Mubarak foreign minister Amr Moussa, who have teamed up to form the self-proclaimed “National Salvation Front” to oppose the presidential decree. ElBaradei should be reminded there were great pharaohs, not just bad ones. Yes, "Morsi is a 'temporary' dictator", screams the headline in al-Masry al-Youm. There are times, especially during a revolution, when it is necessary to act decisively to save the revolution. The kind of paralyzed 'democracy' that the US and the old guard in Egypt want would choke and stall the gains until cynicism reigns and the starving masses cry out for the old order. What is key, is that the firm hand is an honest one, devoted to the people. Morsi's kind are Egypt's only hope now -- selfless and God-fearing, not acting for personal gain or empire, but for the good of the people. He pledged to relinquish his new powers when the constitution is ratified four months from now, and there is no reason to doubt his word. Prior to the revolution in January 2012, ElBaradei too was a hero, a brave figure, able to shield himself from Mubarak's secret police with his international prestige, the man who openly rallied Egyptians against tyranny. In the lead-up to the revolution, he acted in alliance with the MB, as later did Sabahi in the lead-up to the first post-revolution elections. They both underrated the real MB support and determination -- and their own lack of standing with Egyptians -- thinking that secularists would prevail in open elections, that they could make the MB abandon their program. After the MB and Salafis chalked up 75% of the vote, the secularists suddenly found it impossible to accept their junior role in Egyptian politics. Rather than recognizing their own lack of credibility, and accepting the broad MB program while trying to salvage something from the secularist project, they have now drifted into alliance with the old guard and by implication their imperial allies abroad. This is exactly what happened during the Russian revolution of 1917, where the political playing field shifted quickly, leaving key actors flummoxed. Alexander Kerensky too was a liberal 'revolutionary', until he fled to Paris, exposed as a reactionary anxious to appease the British and French and keep Russia in the criminal war which had inspired the revolution. The transition to the new Egypt will not be easy. The striking judges and brazen secularists, who flourished in the Mubarak era, will have to learn some self-restraint or go. Traditionally, revolutions lead to a house-cleaning through retirement, emigration, or in the worst case, through violence. When old elites team up with old and new mafias, they play with fire. 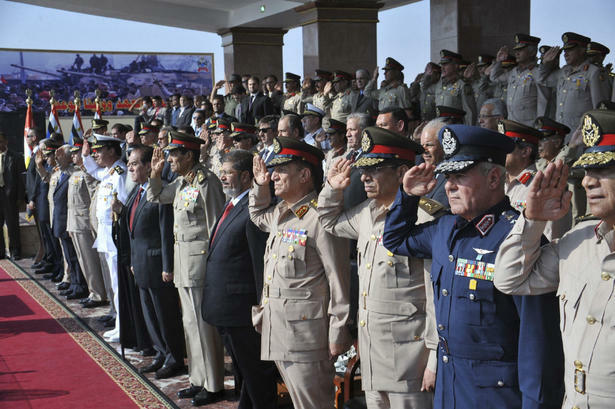 The Egyptian generals bowed out when their bluff was called. The prosecutor general and those eager to scuttle the real democratic process and the birth of the new constitution, with holier-than-thou words about the ‘independent’ judiciary, should do the same now and let the popularly-elected leader get on with the hard work of making sure the revolution is not strangled in the cradle.